NYTimes: If you view it as straight, unchallenged fiction — and that is certainly the only way you should even think of viewing "The Bedford Incident" ... you may find this austerely masculine picture of a maritime episode in the cold war a grimly absorbing speculation on how wrong one ship's captain might be. 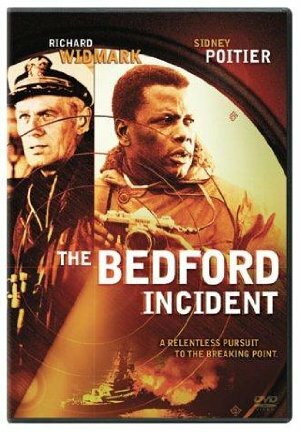 Richard Widmark is the stern and salty skipper of an American destroyer on patrol in North Atlantic waters as an element of the North Atlantic Treaty Organization fleet, and he has an obsessive determination to hunt and hound a certain Soviet submarine. Nothing his fellow officers say can keep him from taking inordinate risks in tracking his underwater quarry among floating ice fields off the Greenland coast. Orders from Fleet Commander that he avoid making contact with the sub only arouse his fuming impatience and cause him to stalk angrily about his bridge. And finally, when orders come through granting permission to challenge the sub, the danger in his too keen chase develops and a fatal accident occurs. For whatever reason I'm a big fan of Cold War movies. This was a little bit like Fail-Safe meets The Enemy Below, but it truly worked for me.